If you are wondering which is the best place to Sell My Car? Then the answer is Wreckery. At Wreckery we buy all sorts of vehicle and in whatever condition it may be in. So don’t wait up to sell old junk car. Do it today and make the most out of your dead or unwanted car. We all want the best whether it is a product or a service. So why not give your car the best farewell it can get? With Wreckery you can sell your vehicle for cash and be assured of environmental-friendly disposal of your vehicle. We are The #1 Car Buyers owing to our expertise, market reach, reasonable pricing, and swift service. So why settle for less when you can earn top money by selling old cars for cash to us. Do you know that you can sell an old vehicle, sell the non-running vehicle, sell old car for scrap, sell the car for scrap, sell the damaged car, sell a used car and sell the unwanted car to us for cash Up to $29,999? Many people see their damaged vehicle as useless and therefore do nothing about it. However, with Wreckery you can make money out of your broken car. So don’t hold onto it any longer, contact us now and find out the worth of your wrecked, damaged, unwanted or old car. Therefore, don’t search anywhere else. Contact Wreckery to sell your junk car. Time is money and money is a time in today’s world. Let that be true when you decide to sell scrap cars for cash. At Wreckery, you don’t have to wait for days to receive some money on the vehicle you already sold. We understand that sometimes getting cash on the spot is of importance and that’s why we are known to pay instant cash to our customers. So, for immediate payment, sell your car to us today! How many times have you decided to avoid going to car wreckers because of the fear that once you contact them, you will not be able to turn back? Don’t worry. We understand that everyone has a right to cancel the deal or not to proceed further if they have any doubts about the service or the value of the car. At Wreckery, we, therefore, offer free no-obligation evaluation of your car. Meaning when you decide to sell the car to scrap for cash, you can contact us. We will evaluate the vehicle and give you the worth of your car as per the market trend. For some reason, if you decide to withdraw from the deal, we will completely understand. You are under no obligation to proceed further even after the evaluation. Also, we do not charge for the review. So don’t worry, call us today for a free evaluation of your car. Advantages of working with professional car removals are uncountable. At Wreckery, we have strived to understand our customers, and we endeavor to provide first class service without wasting time or money for our clients. Car removal is one aspect of selling a car that can eat up your precious time and make a hole in your pocket. Not with us. 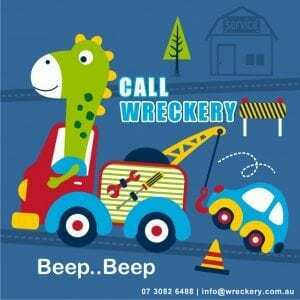 At Wreckery we provide free towing and removal of your car from anywhere in Brisbane. The digital age is a boon for people who are always running short on time. Our online services help the car seller to sell the junk car for cash online quickly and easily. Try it yourself by filling out our online form and experience the fastest money for car services. 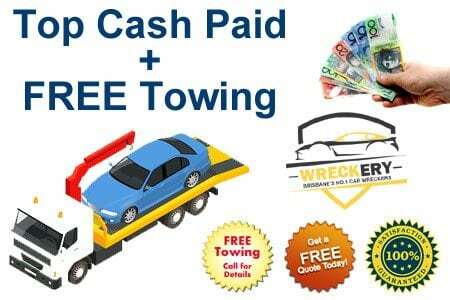 Paying instant cash for the car is the backbone of Cash for Car services. When you decide to sell my old car for cash, we assure you of immediate cash payment irrespective of the number of cars you have. So stop asking yourself ‘where to sell my old car for cash?’ Call us today and get ready to receive instant cash. 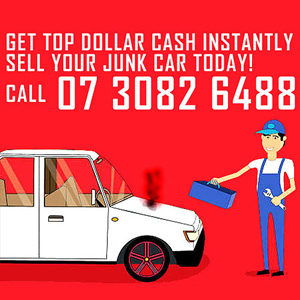 We buy all models of unwanted vehicles so sell your car for scrap and earn Cash For Utes, 4wds, Vans or any other vehicle model you no longer need. Often the service given distinguishes the best from a right service provider. At Wreckery we offer same day removal of your vehicle irrespective of your locations like Sunnybank, Salisbury, Rocklea, Robertson in Brisbane. So call us now to get rid of your wrecked car and free up your valuable space instantly. Where to sell old car for cash is a common confusion amongst the car owners. Let us help you decide. You should choose to sell the vehicle for scrap to car buyers where you can sell your car instantly and also get Top dollar offer. And where else but Wreckery will you get such swift service. Q: I Want To Sell My Car, But I Need To Use It For The Next Couple Of Weeks. Can I Get A Valuation Now And Sell The Car Later? Ans – Yes. Wreckery will give the certified valuation of the car today with the price quote and fix up the car removal date as per your convenience. Q: Will My Personal Details Be Kept Private? Ans – Yes. At Wreckery, you can be assured of complete confidentiality. All conversations and correspondence are kept private (unless otherwise instructed). Also, we do not sell clients information to the third party. Q: Can You Buy Any Car? Ans – Yes. We buy all types of vehicle including but not limited to damaged, totaled, dead, alive, old, registered or unregistered cars. Q: Will A Valuation Cost Me Money? Is There Any Commitment Required? Ans – No. Wreckery offers free valuation and no-obligation quote to all its customers. Q: I Have Finance Owing On My Vehicle – Can I Still Sell It? Ans – Yes. However, you must obtain a letter from your finance company stating the payout figure. We will pay the outstanding amount to the financer and pay you the remaining amount. Please note: If the outstanding amount is more than the vehicle’s value, we can assist in arranging of re-financing. Q: Where In Australia Do You Buy Cars? Ans – Currently, we operate in Brisbane and its surrounding area in Australia. Q: Can Are You Selling Provide Company Car & Fleet Valuations? Ans – Yes! We have the team of professionals who will provide company car and fleet valuations with multiple quotes if needed. Q: Once I Sell My Car To Are You Selling, How Long Does It Take To Receive Payment? Ans – Most cases we pay money on the spot on the day of car removals. However even if the payment is in cheque form, you will receive your amount in your bank account before the day of car removal. Q: How Does The Best Price Guarantee Work? Ans – All we need is a genuine offer letter from the competitor or dealers (should be a cash offer and not a trade-in), and we will beat it.